Your teeth are made of the hardest substances in the body: enamel. Tooth enamel is harder than bone! Yet every single person is at risk for cavities, which are more formally known as dental decay or dental caries. In dental decay, bacteria in our mouths produce acids from the sugars that we eat which then attack our teeth. In addition, acidic drinks such as sodas and some fruit juices also promote decay. As teeth cavities progress, the surrounding tooth structure begins to soften and can ultimately form an actual hole (hence the term cavity). 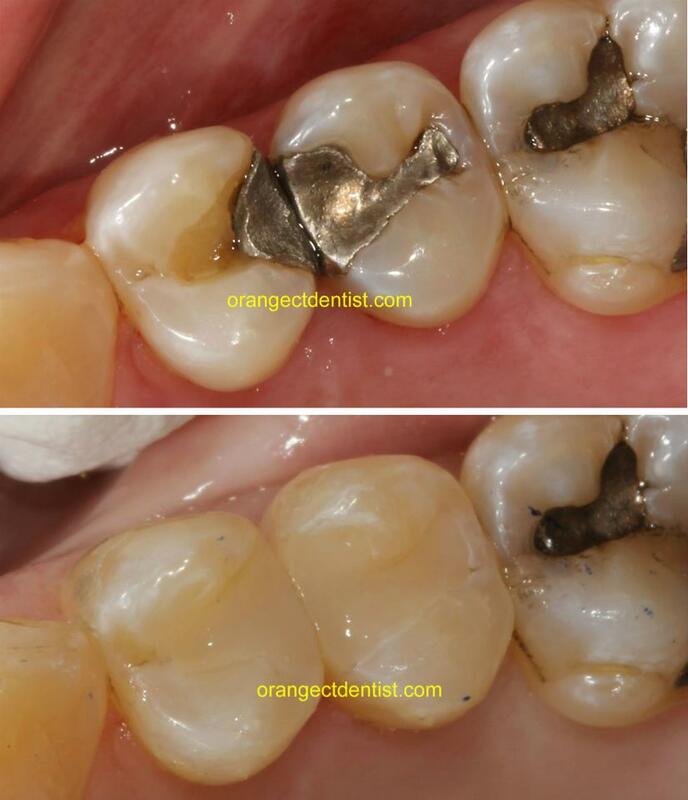 If the decay gets really big, it can ultimately require a crown and/or a root canal to fix. Or worse, sometimes the tooth cavities get so big that the tooth needs to be removed. However, most new cavities are caught early enough so that they are small to medium sized. In these cases, a filling is what is needed to restore the tooth. Photograph of a single tooth with decay (cavities). The decay is visible in the picture on the left. The decay is removed as seen in the middle picture. Then a white filling is placed as seen in the photo on the right. Case by Dr. Nicholas Calcaterra. Tooth colored fillings are used to fix cavities on both front teeth and back teeth. The manufacturer of our tooth colored filling materials has certified their materials are BPA Free (Bisphenol A). Our Orange, CT dental practice is a BPA free office. We frequently receive questions regarding silver mercury (amalgam) fillings and whether they should be replaced. Should they? Silver Mercury Filling Replacement. Click to learn more. Visit our page on silver amalgam fillings to learn more about our philosophy on removal and replacement of silver fillings. Contact us today if you would like to make an appointment for us to evaluate your teeth.